Please help me with this using Mass point Geometry. AG : GC = 4 : 1 and BF : FG = 17 : 7. 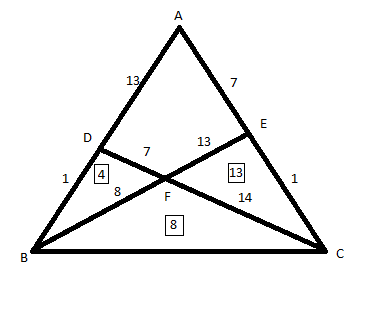 How to balance this problem to arrive at the answer ? You haven't specified anything about point G.
and how you simplified it later , could you elobarate it a bit ? Ratio of base is known, you can re-distribute the weight according to this ratio to obtain corresponding weights. but why are bases being taken as 21 ..how are you assuming both to be the same is it given in the problem ? is it ok to assume like that ? Hi Prateek, how to solve quadrilateral problems with this concept?